We have a helpful members thread, but I thought it'd also be useful to know any mechanics or garages in your area that do good work, don't charge an arm and a leg, and that you'd like to recommend to other members in your area. I had my cambelt changed by Deepak Gohil at the weekend in West London. He's known on the GTi forum pretty well, and after hearing good things and seeing how reasonable his prices were, I thought I'd go to him to get the work done. He was very friendly, knew what he was talking about (he's an ex-Peugeot mechanic, now an aircraft engineer) and took a look over the car when he was done to see if there was anything else that might need looking at in the future. He also let me know my aux belt needed changing, but confirmed the price with me in advance rather than just going ahead and sticking me with a larger bill when I got back (which I was very pleased about, as I've had this done in the past). Anyway, the price was Â£240 for a cambelt, aux belt, tensioners and water pump change, along with a coolant change, which I feel is a reasonable price. Saxo parts. langly mill. 07720663995 01773718188 bloke called jason. just found this place and im glad i did. knows loads about french cars. lowered mine and fitted dampers for Â£75. servise was Â£35. said he can do my cam belt (1.6) Â£130 all in. i could go on but just give him a ring. hes on here as well. username... mandyslover70. was it you dan who passed his number on to me? someone on here did. Jason's does a top job. He did my rear beam, seized shock and mounts at a great price. The place looks like a right shithole but the two guys there work very well and quickly. Nothing posh but they know there stuff, pricing is very reasonable and it is literally right next to norwood junction station so great for getting home should you need to. I'm going to be boring and say krisB as I look after my car myself as I'm a trained mechanic, when I haven't got the tools and have lots of jobs to do + don't like doing them..I see kris lol. Nice bloke, knows his shite and we have a good chuckle . I think his prices for some of the work he's done for me has been really good, he let slip one time he stitched himself up, so I gave him 30 more. He did the cambelt, water pump, tensioner, full service and lowered the car with springs provided by Mr Airey for 270. I know this isn't the traditional way to introduce myself but I'm Deepak; the chap Scott mentioned in the post at the top. I carried out my apprenticeship with Robins and Day Peugeot Chiswick, gaining fully qualified service technician status with ATA accreditation. I then studied aircraft engineering and now work for the country's national flag carrier maintaning jumbo jets. I'm based in West London, Southall and work from my garage at home. I am capable of all kinds of tasks on the 306, but my preference is timing belts and water pumps; for the simple fact that I do work full time and it's the kind of job that doesn't take a lot of my time and I have a good system for fitting them therefore can offer a good rate on them. I know GTi6's inside out, but can just as easily work the other XU, TU, DW Etc engines. I am having issues with sourcing parts at the moment as both GSF and ECP are very unreliable (nothing new there then) so I'm encouraging those who do have any work done to use genuine parts; although if an alternative is required we can work that out between us. I work a 4 on 4 off night shift; some consider this flexible, but I'm available for pick ups and drop offs almost any time with enough notice. I'd describe myself as friendly and reliable all the while staying competitive when it comes to price. I hope some of you will get in contact as it's great to meet 306 owners; I've found they come in all shapes and sizes! How much does Jason from Derbyshire charge to lower torsion bars? Soon To Be Stage 2..
Â£75 I think it was mate. Not blowing my own trumpet but i owned my garage for the last year and a half... had a succesful first year and half am i now in the process of re locating to a new garage with 3 ramps and more room... i offer lowering servicing tyres basically everything. Im fully qualified and served my time with peugeot as a apprentice. i havent mentioned this on here befor because its not why i joined the site to promote my busisness but i always like to help out where i can. Thorne rear beam hit me up? (21-08-2012, 07:58 PM)thethorne Wrote: Not blowing my own trumpet but i owned my garage for the last year and a half... had a succesful first year and half am i now in the process of re locating to a new garage with 3 ramps and more room... i offer lowering servicing tyres basically everything. Im fully qualified and served my time with peugeot as a apprentice. i havent mentioned this on here befor because its not why i joined the site to promote my busisness but i always like to help out where i can. I didnt expect you to ever mention that on here to be totally honest!! But i can vouch for your work. Its second to none, and always completed to the highest of standard!! This is the only person i will let work on any of my cars!! 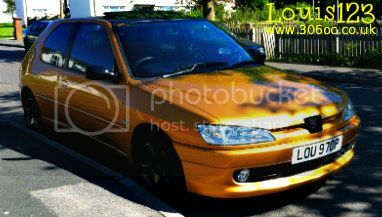 Not just saying it because he's my mate, but i can 100% highly reccomend without any doubt at all.. a Peugeot guru lol!! Any competent welders in the Brighton/south area?? That's the garage that Amies dad uses, and the one I went to after my wheel fell off. Pretty tight place! You mean, after your car "did a matt"
(22-08-2012, 04:51 PM)samass Wrote: You mean, after your car "did a matt"
For Bristol I'd recommend the Formula 1 Autocentre on Days road in St Phillips. Speak to Marek or Craig. Any work I can't/don't want to do on my cars gets given to them and they've always been great with me. Fair prices and don't do stuff that doesn't need doing etc etc. Fucks sake. Why is it "did a Matt" I didn't happen that many times to me! (23-08-2012, 01:45 PM)Matt Wrote: Fucks sake. Why is it "did a Matt" I didn't happen that many times to me! I'm thinking of completely the wrong place in the wrong town and wrong garage. Just forget I spoke.